Amazing Science, Volume 1 . . . A T.O.S. Review | My Journeys Through Life . . . Herding Cats In New Mexico! ← Weekly Wrap-Up . . . When Our “Schedule” Was Off Duty . . . Anyone who knows me well, KNOWS I am simply NOT good at science (right, Charlene? lol!) So, when I saw that this particular review of Amazing Science, Volume 1 would have SIMPLE experiments, explained by the instructor, Jason Gibson, in a way that even *I* could understand (never mind the children), I decided to go for it! Jason Gibson has earned advanced degrees in Engineering and Physics, has worked as a Rocket Scientist for NASA, and loves teaching Science and Math (don’t even get me going on how much I have always hated Math, lol!). 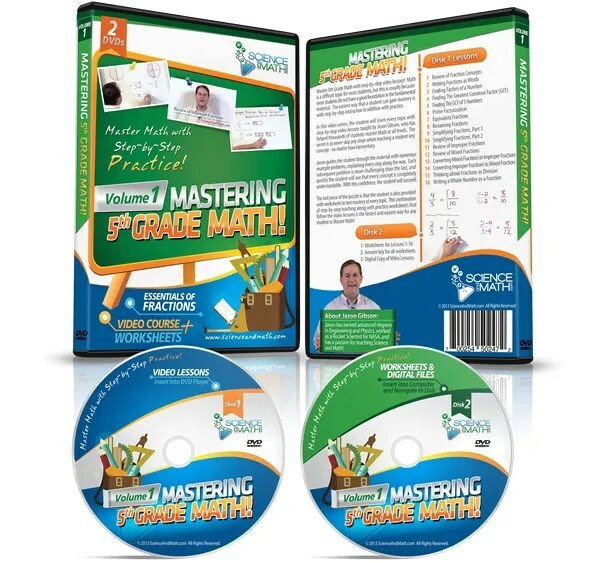 The product we received for review is, as I said above, Amazing Science, Volume 1, which comes from ScienceandMath.com. It comes in one DVD case, which holds two separate DVD’s. On those two DVD’s, we found 23 different science experiments to watch, learn about, and actually do, in very little time, as long as we had the needed materials around the house. For this review, I am going to focus in on the Color Changing Milk experiment, because all of the boys thought it was cool! I heard plenty of “oooohhh’s” even from the one kid (“that would be “The Batman”) who was complaining about watching when he wanted to play a video game, lol! 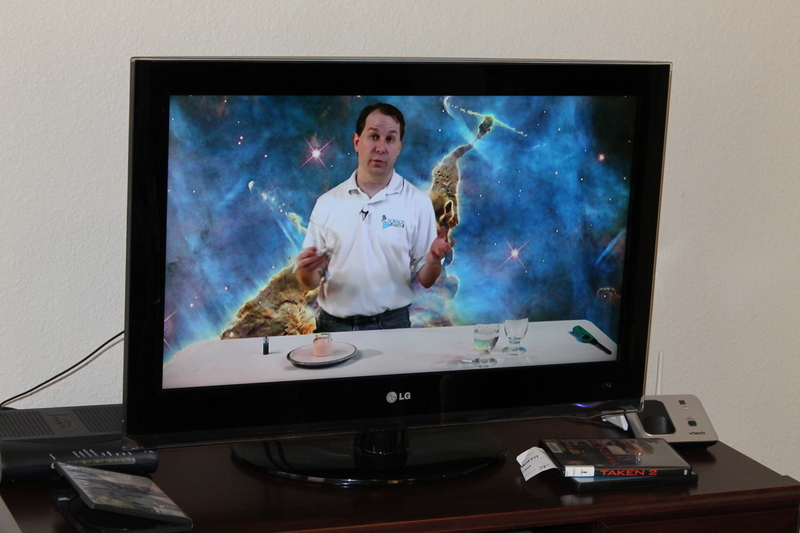 Here, we see the instructor on our TV screen, talking about one of the experiments, and explaining the science behind it. 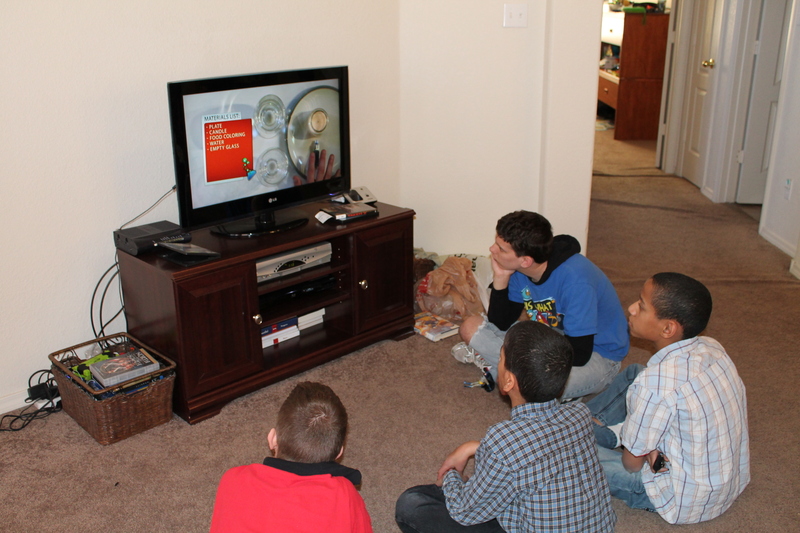 All four boys, watching with definite interest, while Mr. Gibson explains what he is doing, and why. 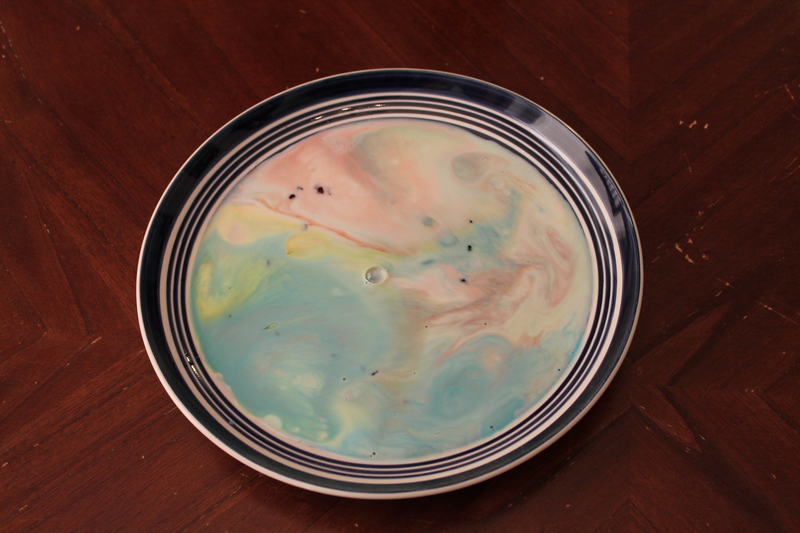 The Color Changing Milk experiment, which was absolutely the top vote getter for which one to put on this blog post, was a hit. All four boys really loved how it came out! Here are some pictures of the process while getting things ready to go. This is me, getting things started . 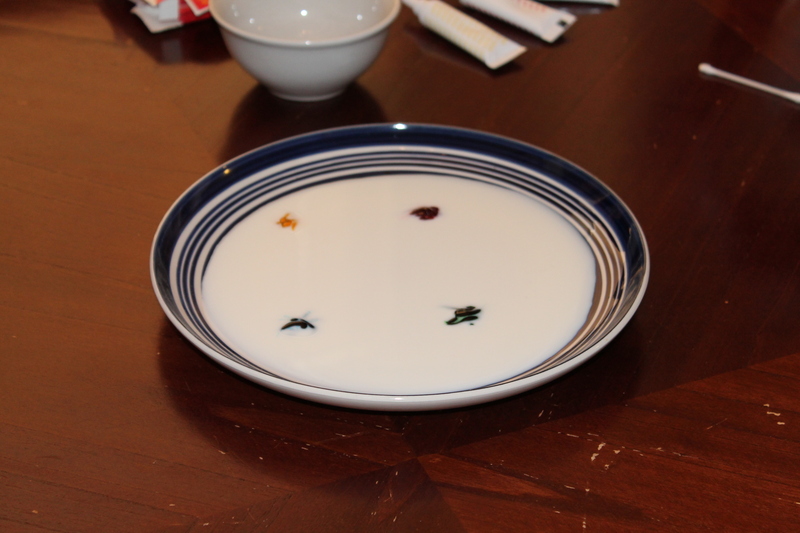 . .
Now, we add the four food colors into the milk. We honestly thought it might not work, because the only food coloring we had was the gel kind, and Mr. Gibson was using the liquid sort, however, if you will watch the video below, you’ll see how well it worked! 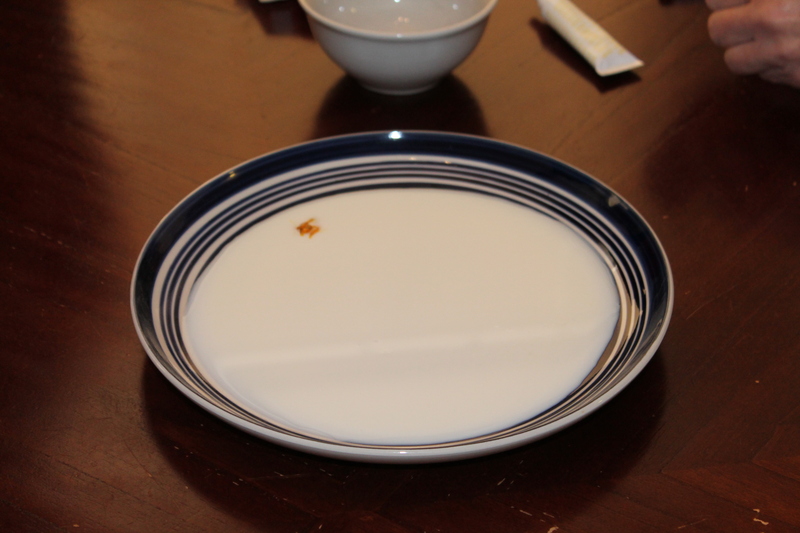 Here is how our plate of milk looked when they had really finished up as much as possible. 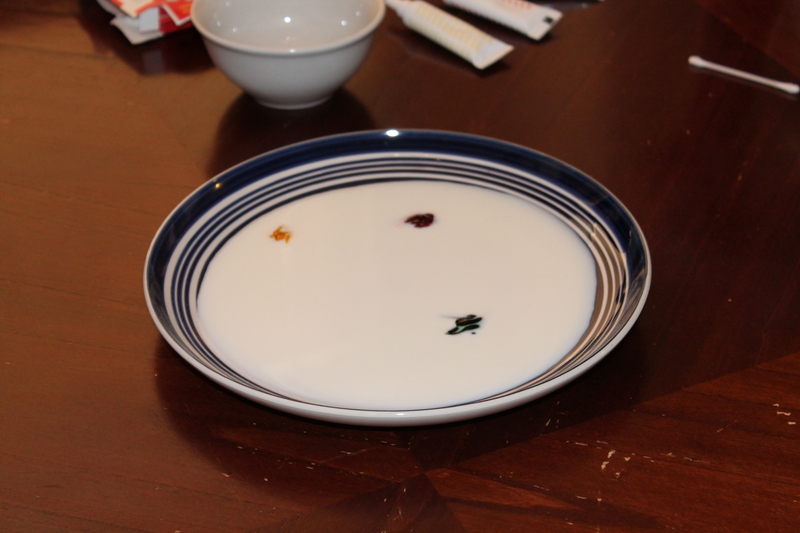 At this point, all of the fat in the milk had clung to the dish soap, so the only way to do it again would be to start over with a new batch. So, we have learned how it is that the soap works better than just water when we wash our hands or our dishes, especially if we are trying to wash off something with fat in it. Here is “Mr. 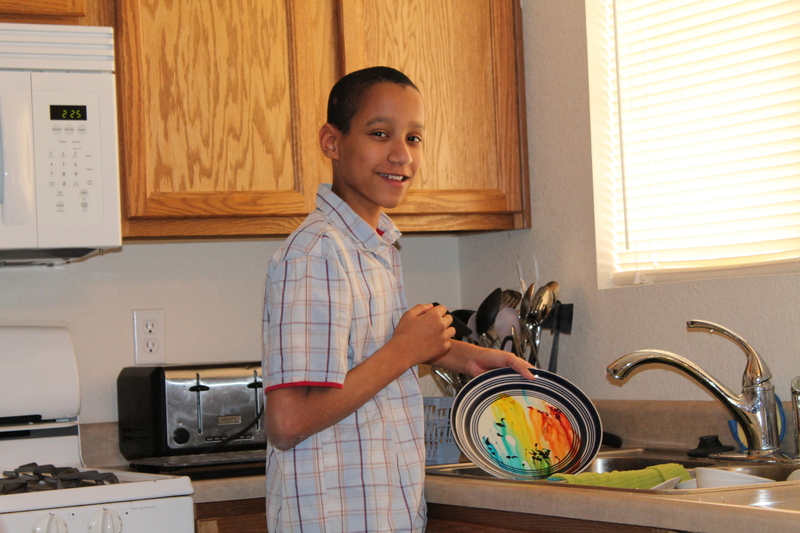 Loquacious”, rinsing the plate off with cold water, but all of the boys loved what he discovered when he dumped the milk into the sink, BEFORE he actually began rinsing it . . . Here are some samples provided on the company’s website for the following experiments . . .
“Amazing Magnetic Force” . . .
And if you go to Amazing Science, Volume 1, you will find links to a couple of other samples, as well as the complete DVD chapter index of all that you will get on this set of DVD’s. 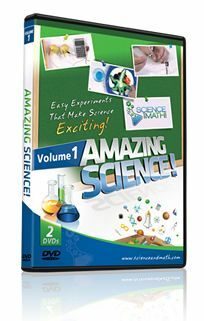 Amazing Science, Volume 1 is available as a DVD set for the cost of $ 17.95 (a discount off of the retail price of $24.95), and as a digital download for $14.99. I do think this product is at a very good price point for what you get! I am supposed to tell you that the intended age range for this product is grades 1 through 3, but let me just tell you, every single one of my boys love it, and so do I. And I am WELL past grade 1 – 3, lol! In fact, there would literally be only one thing that I don’t care for about this package. I wish the company would make a little mini booklet to insert into the DVD case, sort of like the liner notes that you see in music DVD’s, listing the materials needed for each experiment. That would make it much easier to collect the materials needed BEFORE watching the DVD. My kids wanted to do some things for which I really did not have the materials on hand (like copper pipe, a bicycle tire pump, etc), but we did have materials on hand for a few things. This DVD set would be wonderful for any homeschooling family, but I think it would also be great as a supplement for students who are in public or private school. In short, it’s great for anyone! 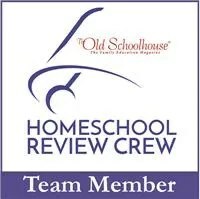 If you’d like to read what other crewmates thought of Amazing Science, Volume 1 and other products (Mastering 5th Grade Math – Volume 1 – Essentials of Fractions, Algebra 1: Volume 1, & Fractions Thru Algebra Companion Worksheet CD) from ScienceandMath.com, please click the graphic below . . .